Andre Yeu is a professional dog trainer from Toronto, Canada, and the owner and head trainer at When Hounds Fly Dog Training. He is a Karen Pryor Academy Certified Training Partner (KPA CTP) and also has his Certified Professional Dog Trainer, Knowledge Assessed (CPDT-KA) designation. No classes or orientations are scheduled from March 21 – 25 inclusive as the entire teaching staff at When Hounds Fly are at ClickerExpo in Washington, DC. We look forward to bringing back what we learn to improve our students’ learning experiences. Please note, any admission forms or applications will not be responded to until we’re back and running on Tuesday March 26th. So please be patient! When Hounds Fly is closed from Thursday May 31 to Monday June 4 inclusive because most of us will be attending the Fenzi Dog Sports Academy Training Camp 2018 in Wilmington, Ohio! We look forward to learning from the brightest minds in Dog Sports training from disciplines such as Agility, Obedience, Nosework, and Canine Freestyle. In the meantime, please note that we will generally NOT be checking emails or admissions forms, so please be patient and we’ll be getting back to your inquiries after June 4th. In our Puppy Socialization classes, one of the lessons we try to teach new puppy owners is how to recognize the signs of appropriate and healthy play between dogs. On one hand, we have some owners that are “helicopter parents” and at the onset of anything more physical than polite sniffing, they feel like their dogs are in mortal danger. 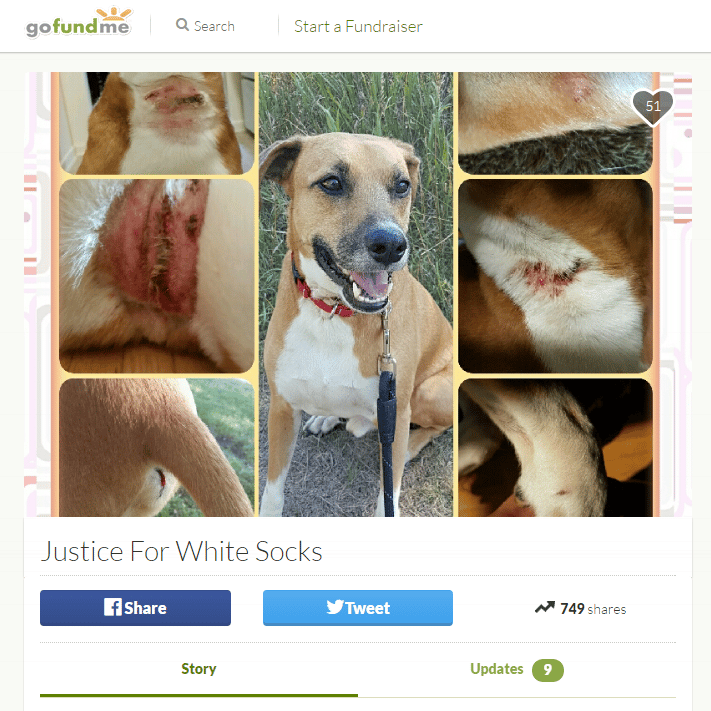 On the otherhand, we have some owners who believe their dog who is bullying or over-aroused is just playing with good intentions, and we are being too uptight. “Let dogs be dogs, let them work it out”, they’d say. As instructors, our job is to either help those who are worried feel safe that their dog is having a good time – yes that includes facial and ear nips and tumbling and wrestling. Our job is also to identify when a dog is getting overaroused, or is *not* picking up on the cutoff (please stop!) signals of other dogs and to interrupt or time-out. To help our students (and anyone, anywhere!) we commissioned Hyedie Hashimoto to create an infographic. Please download a copy and print it off for your dog training facility, dog daycare, dog park – wherever it might be useful! Back at the end of February 2017, you may recall, you came over to our house to help us with Sandy, whom we rescued in November. He was a terrified little guy – frightened of everything and everyone. 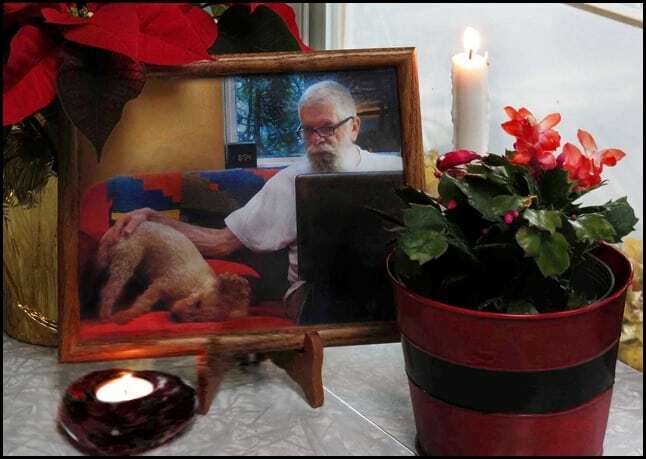 Sadly we lost our Sandy on Tuesday November 21st from his congestive heart failure. 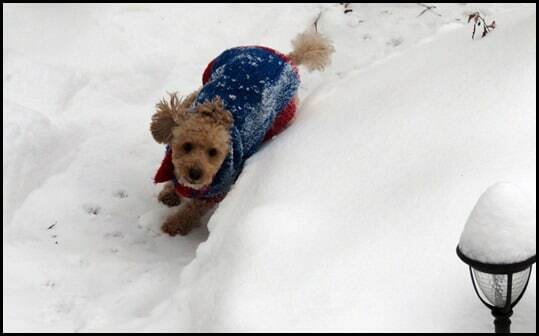 We are heart-broken … but Sandy left this world a very confident dog; his fears, for the most part, a thing of the past. No more barking at cars, noises, other dogs or people. In large part we have you to thank for this- for teaching us how best to help him. As we now reflect on the final year of his life he spent with us, we wanted you to know how much we appreciated all your help and guidance with Sandy. And we know, Sandy thanks you too. 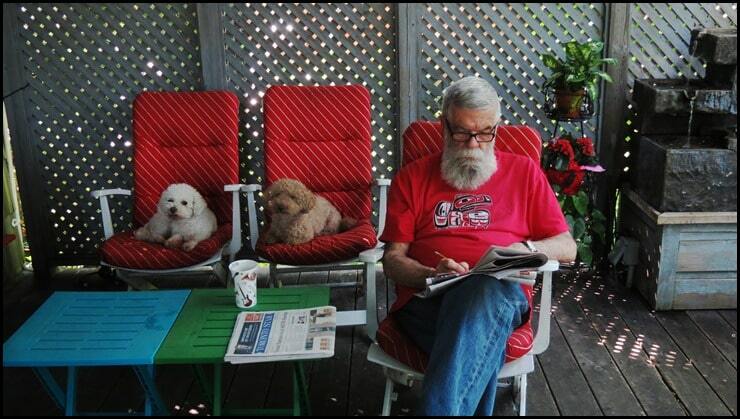 Gary and Bill adopted Sandy just a year ago at the ripe old age of 9 years. In the year they cared for him, they not only gave him a loving home but also the gift of confidence. He used to bark and lunge at any dog or person on the street. But thanks to their hard work and commitment to desensitization and counter-conditioning, by this past summer, Sandy was able to take classes with us and meet people and dogs at the school and in their neighbourhood. Please consider not only adopting and rescuing your next dog, but also consider taking a second look at the older ones too. Of all the dogs in need of homes, they need our compassion the most. 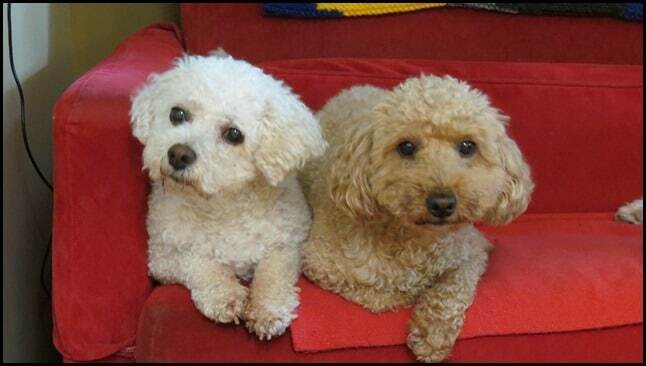 They often gave their unconditional love to their owners only to find themselves abandoned in their final years. 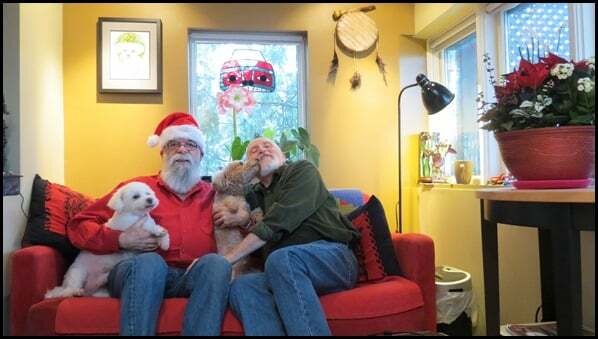 So, like Gary and Bill, let’s help and make a senior dog’s final years the best ones. 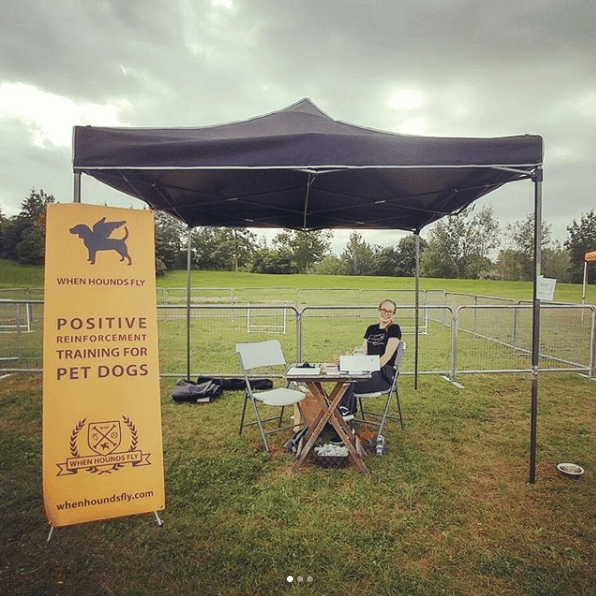 I started When Hounds Fly Dog Training in January 2010 as an experiment to see whether dog training services – specifically, centered around Clicker Training, could become a full-time career for me. At the time, most of the dog training schools operating in Toronto were part-time businesses, where the instructors drew their primary income from either white-collar day jobs, or made the majority of their income through other dog-related services (such as dog walking). Fast forward to 2017 and When Hounds Fly now has four employees (if you include myself), three of whom work full time, doing dog training and behaviour consulting. So, the experiment paid off! One of the biggest challenges I’ve faced in growing this company is finding qualified people that met my high standards for instructors. In the early days, I was extremely lucky and qualified people found me. My early part-time instructors came already knowledgeable, already experienced, no training or skills development required. 2017 – Sara Russell joined our team early this year, already completing her KPA-CTP and coming with years of experience in the field. By 2014, I realized that the odds of just finding qualified people who would apply for either part or full-time positions as instructors were extremely low. So, I turned my attention towards helping mentor and coach people who were passionate about our mission, so that in the end, they could hopefully be instructors at our school. 2014-2016 – Verena Schleich and Katie Hood became instructors at When Hounds Fly while volunteering and assisting classes and completing their Karen Pryor Academy Certified Training Partner programs. Katie and Verena were the first two people that I can say that I taught everything I knew to. All the insight and experience I had accumulated to date, I tried my best to impart to them to help them become as complete as possible. They have both since moved away from Toronto and I know they are out there doing excellent work in the field. From 2016 onwards, I’ve been focusing my energies on personally developing talented people to help meet the needs of our community. In the past, I left the formal education to organizations such as the Karen Pryor Academy, Pat Miller Peaceable Paws, or Jean Donaldson’s Academy for Dog Trainers. Now, having spent years working with people and mentoring them, my goal is to transition towards developing qualified dog training professionals in-house. Tim Alameciak had volunteered for nearly a year as a classroom assistant, and his own quest for knowledge and self-study gave him the foundational knowledge needed to be an instructor for our team. And, most recently, Kelsey Edwards, another one of our year-long volunteers is next. 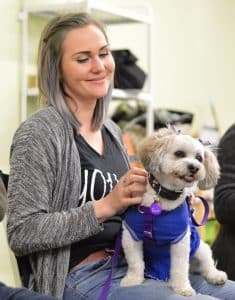 Through our own internal training workshops, 1-on-1 coaching sessions, and guided self-study and reading lists, she leveled up to a point where her knowledge rivals that of those who graduate from recognized dog trainer certification programs. Over the years, we have had many people inquire about volunteering at our school to gain experience. Some stay as few as a couple of weeks and then stop showing up. Others have been extremely committed (and through hard work, ended up being instructors here). In 2012 we had a Working Holiday Visa visitor from Japan, Megumi Yamanaka, volunteer as a classroom assistant for a year( Unfortunately I never got a picture with her). She is teaching dog training back home now. 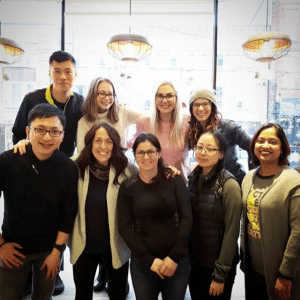 In recent years, Monisa Nandi, Stephanie Tran, and Megan Taylor have volunteered as classroom assistants with us – long enough for us to say that they’ve learned a lot and we’ve trusted them with different aspects of teaching and working directly with our clients. And, Claire Kilburn volunteered with us for over a year while completing high school. 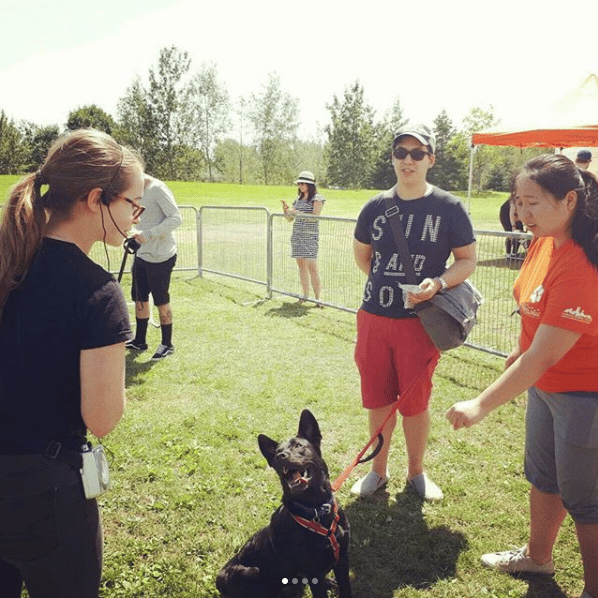 She’s studying at McGill now, but works remotely as our admin assistant, and this last summer, she had the opportunity to teach both in the classroom and also be our representative and instructor at Paws in the Park. There are some people who have volunteered with us for a month or two, once a week and now go around saying they apprenticed under me, which is a big misrepresentation (the first few months are just cleaning up messes and filling up water bowls… it’s a long time before I let people even answer simple questions or speak in class. While I am still very much involved directly in teaching (both group classes, and private lessons), I am transitioning towards skills development for our team – both our instructors and our volunteer classroom assistants. I’m getting good at it, and in the end, our community will benefit from a greater number of highly qualified dog training professionals. To our committed volunteers, past and present – I wanted to express my gratitude to you and also complement you for your commitment to the process. Thank you!!! 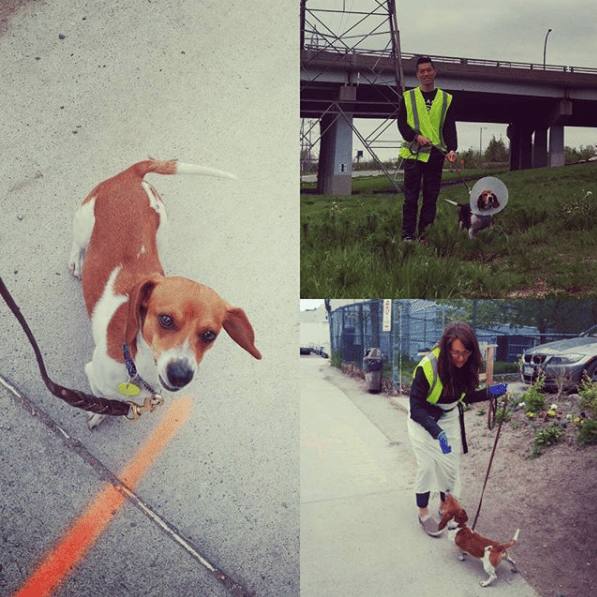 This year, we’ve had the opportunity to work with the Toronto Humane Society in a variety of ways. One of our missions is to improve the welfare of animals (in particular, dogs), so it was our pleasure to offer our expertise and services to them. 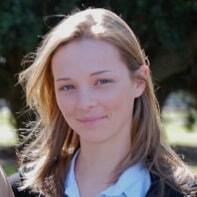 Rachael Johnston has had the opportunity to provide consulting services to discuss behaviour modification for a number of dogs under the care of the Canine Behaviour Team at THS. THS’ annual fundraiser and adoption festival. We hope to have future opportunities to work with the Toronto Humane Society to share our knowledge of humane training methods and clicker training again in the future! Our commitment to excellent dog training means despite working with over 4000 dogs (and their families) for the last 7 years, we continue to invest in education and are never done learning. 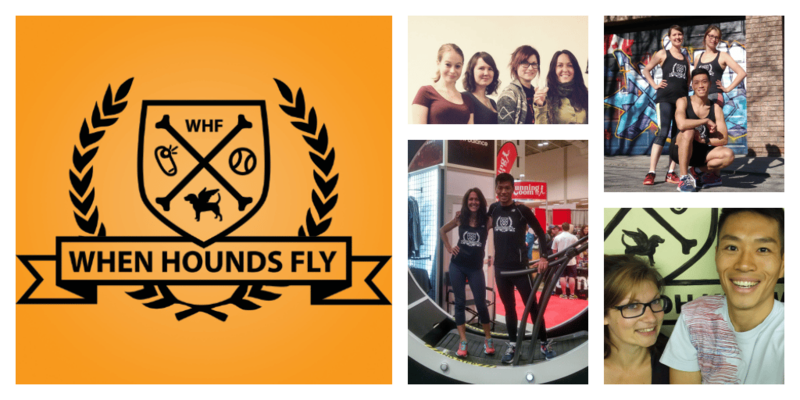 Instructors at When Hounds Fly are away for a week to attend ClickerExpo in Portland, Oregon. Please note our school is closed for all current students from January 25 to 31st. Our administrative staff are responding to New Student Enrollment Forms/Class Registrations during our closure, but our response may be delayed. Inquiries or special requests may not be responded to till we resume operations in February. Thanks for your understanding and we will see you in February! Thank you very much for visiting our web site and checking our services out. Since I started When Hounds Fly in January 2010, over 4000 dogs and their families have taken classes with us. 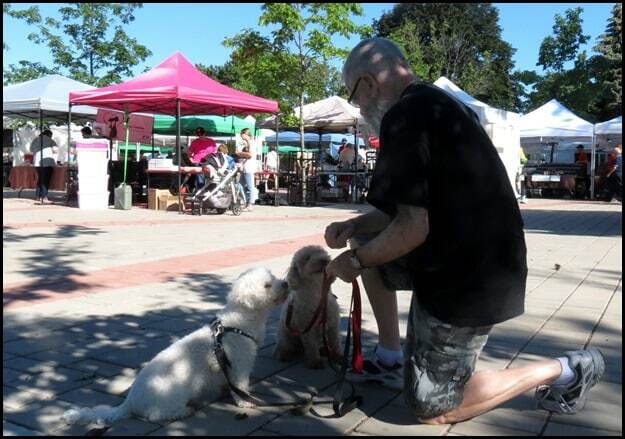 My mission when I opened our first location at 1108 Dundas Street West was to raise the quality of dog training services in Toronto, and to improve the welfare of pet dogs in our city. Thanks to the success of our students, word of mouth spread quickly and we grew. 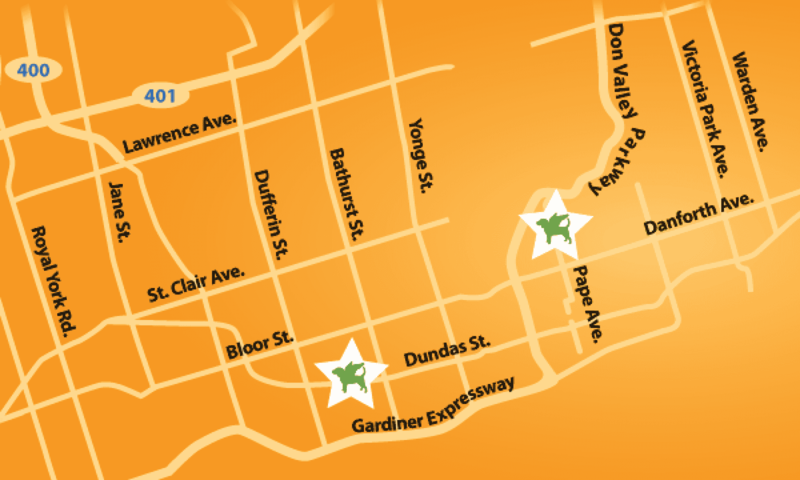 Our Dundas West location now has two training halls and we frequently run multiple classes per night that are always full. 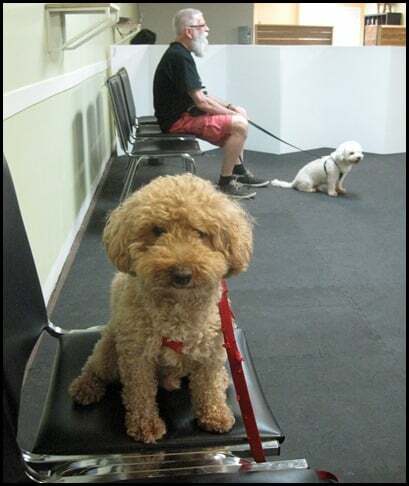 Requests for private lessons to help with dogs that have fear, anxiety, or aggression issues pour in, to the point where new students were waiting many weeks for a first available appointment. From an economics perspective, when demand for services exceed supply, it’s time to increase supply. The problem is it’s not easy for me to increase our availability. I can’t just “train up” new employees to meet demand. Finding experienced, professional dog trainers with sufficient practical experience and academic experience is very difficult. (We’re hiring – in case you know of anyone!) Unlike big-box dog training schools, we don’t have a “6 week teacher training class” and certify people to be instructors. Rachael Johnston and Sara Russell have 10+ years experience. We are that serious about qualifications and expertise. Going back to economics – if supply can’t be increased, then I could just increase prices to reduce demand and maximize profit for our business. I am, however, community-oriented at heart, and I want people who have modest incomes to be able to afford our services and programs. I don’t want to price ourselves such that only the wealthy can benefit from our classes and services. So, I haven’t increased prices of group classes since 2014. I’ve setup this business to avoid unnecessary frills (such as a receptionist who answers phone calls – when all the basic information is freely available on our web site and most customer service functions are fully self-service) and put all our resources into teaching and lessons. Our newest facility at East York can accept students almost immediately. We have both extra classroom capacity and teaching resources. If you want to start Puppy Socialization or Foundation Skills class as soon as possible, please enroll at Pape Village. Our investment in our Pape Village location is very important to us, therefore our most experienced instructor, Rachael Johnston, teaches the majority of classes here. Our original location is very busy, and we carefully limit the number of new students we take in per week to avoid having more students that we can serve. As of this update, we are currently accepting applications for new students, however, New Student Orientation spots are only available for later in August with an eye to be taking classes in September. As of mid-June, on average, between all of us, it is about a 4-6 week wait time from the time of enrolling to your actual first appointment. And like all things in life, good things come to those who wait – hiring someone strictly based on who can see you first usually results in disaster. Thanks for taking the time to read this. I look forward to meeting you and your pup at school soon. Just this month I was asked by two people (a fellow Karen Pryor Academy trainer, and a Toronto veterinarian) whether I do board and train or whether I had referrals for trainers that did. Starvation – In a mere 8 days he lost 4 lbs. For some reason, despite stories from 2010 and 2014 of cases such as those highlighted earlier, people continue to sign up their dogs for lengthy and costly board and train services. My intention in this blog post is to clearly argue why we do not support board and train services, nor offer them. Board and Train services are popular amongst trainers that rely on shock collars and prong collars, because normal human beings that care about the welfare of animals would intervene and stop someone from using these tools on their beloved pet if they were there to bear witness. In a board and train facility, the training is done out of sight, so these trainers can inflict whatever level of aversive they feel necessary to get the job done. In the cases above, dogs suffer severe psychological and physical trauma. Dogs have even died in board and train facilities. Would you send your dog to a place like this where injury or death could occur? If the training occurs on a barn or a house somewhere far away, the training done will not automatically translate back into your home, your property, and your neighbourhood. Therefore, the majority of the training should occur in the dog’s home and neighbourhood, which means the majority of the training needs to be done by the owner. 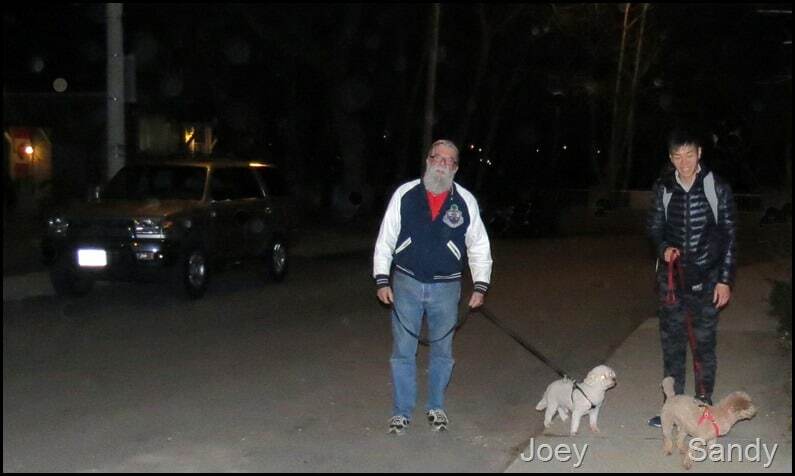 Don’t like the fact your dog pulls on leash? If you walk your dog three times a day, it would only take a week or two of not reinforcing Loose-Leash Walking for all the board and train work to unravel. Your dog barks at strangers? Unless you continue to intervene and follow training protocols, any headway made in a few weeks of board and train will quickly dissipate. 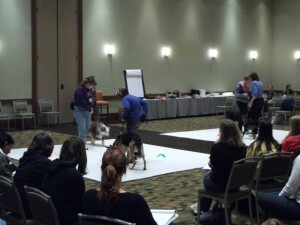 This is why our focus as a dog training school is to teach owners how to train their dogs. It must become second nature to the owners how to reinforce desirable behaviour and become a lifestyle change for long-term behaviour change to occur. A couple of hours of “handover” training done at the end of a board and train is not enough to time for behaviour change in the owner to stick. 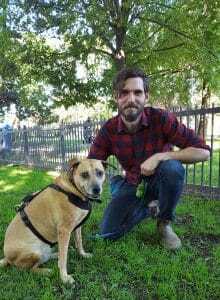 If I were taking $3000 from an owner and board and training a dog, I would feel immense pressure to “get the job done” and return a fixed dog. Unfortunately, dogs are not cars, and I cannot accurately predict how much time and effort is required to make improvement. If towards the end of a board and train session, I’ve failed to make good progress, I would feel pressured to rush and push the dog beyond what is appropriate, safe, or humane. 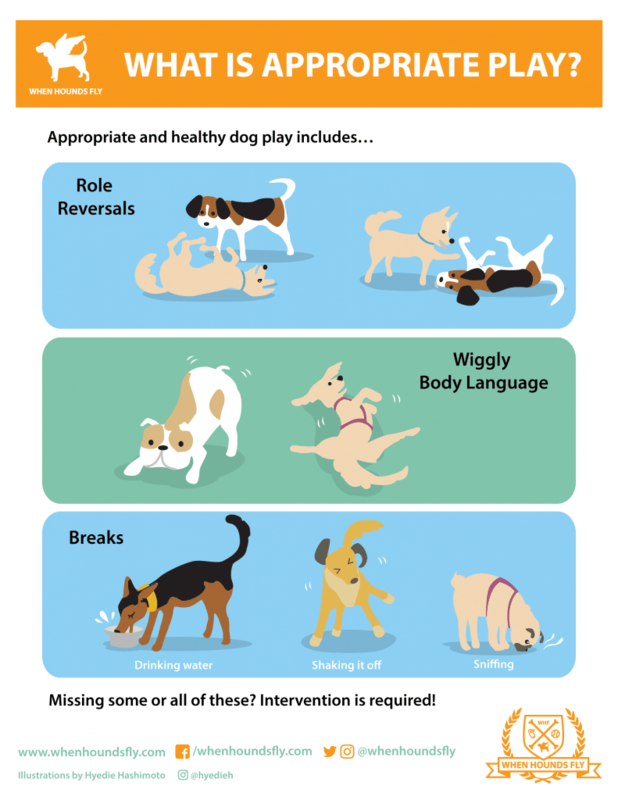 How long does it take to improve behaviour in a dog? The answer is, however long it takes. Board and train puts immense pressure on a trainer, sets expectations for the owner far too high, and the one who suffers for that is the dog. When we help owners and their dogs, sometimes we see immense improvements in just a week or two (of the owner working daily on their own). In other cases, it’s a process that lasts the entire dog’s life. To impose timeframes and expectations is in conflict with our code of ethics to have the animal’s best interests at heart. Working With Owners is Reinforcing for Us! 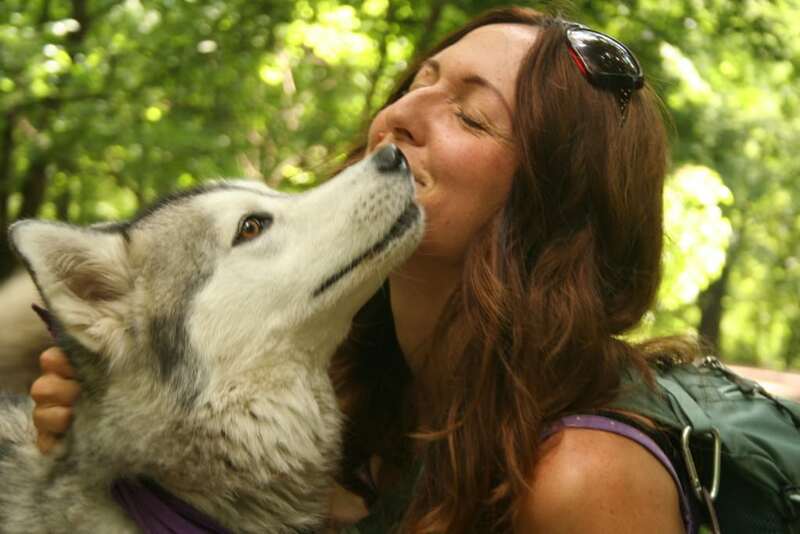 Instructors at When Hounds Fly are dog people for sure – but we’re also into people. Coaching people to become excellent dog trainers, seeing their progress, and hearing firsthand of the improvements they see in their relationships with their dogs – thanks to their own hard work – that’s what motivates us to keep on working. In summary – board and train? Don’t do it! 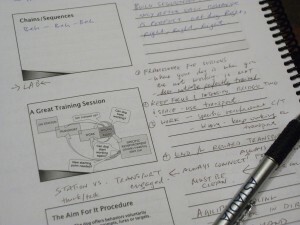 Most positive reinforcement trainers don’t offer it as a service, for the reasons above. Let us teach you how to train your dog, and you’ll see how it’s not a chore – it’s actually a lot of fun! P.S. 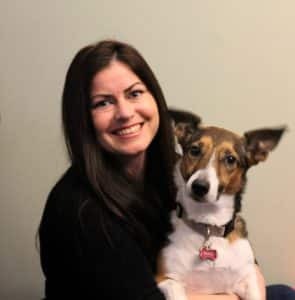 – One exception to our board and train rule is at Canine Country Kennels in Barrie, their board and train is done by Katherine Ferger, who is a very experienced Karen Pryor Academy trainer. However, as mentioned in the article, for the benefits to stick, the owners have to learn how to be excellent clicker trainers at home as well.